We are excited to announce Open Registration for our Summer Camps this year. Camps are being offered in partnership with and run by Howie McCann and Windward Baseball Academy's professional coaching staff. Camps are open to Rising (Spring 2020 Age Group) 7U-12U Players. Anyone else who would like to attend please contact us for additional details. You can register on-line by clicking any of the camps listed below. Weekday camps include 4 DAYS for $200 and run Mon-Thurs from 9:00 AM-1:00 PM, with Fri being used as a rainout day. These camps with cover all aspects of being a youth baseball player including fielding, throwing, base-running and hitting. This is a great opportunity for players to keep their baseball skills sharp, stay active and/or prepare for the Fall Recreation and Travel Seasons as well as have a lot of fun with Howie and his great team! 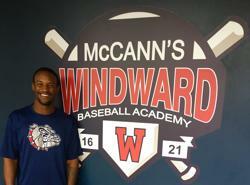 Founder and owner of Windward Baseball Academy. Howie played baseball at Missisippi State and was the Head Coach at Marshall Univeristy. He has over 50 years of baseball experience and is passionate about helping all players improve so they can grow their love of this great game. Father of Atlanta Brave's Catcher Brian McCann. Erick grew up playing at East Cobb for the Braves and the Astros. He attended East Paulding High School where he was a three year lettermen in football and baseball. After his senior year of baseball, Erick was selected for the Georgia Dugout Club Senior All State Games as well as the Dugout Club Team Georgia and First Team All-State. Erick spent his first two collegiate seasons at Darton Junior College in Albany, Ga, where he played middle infield and third base in 2009 & 2010 leading his team in stolen bases both seasons. After his sophomore season at Darton, he transferred to Campbell University in Buies Creek, NC. During his 2011 season as a junior, he primarily played third base. Following his junior season at Campbell, Erick was converted to an outfielder where spent his 2011 summer season in the Perfect Game Collegiate Baseball League where he was named the to the PGCBL All-Star team in which he also received Player of the Year honors and landed in the top five of nine offensive categories while being voted the league's top prospect and named to the Summer All-American Team by Perfect Game. In 2012, Erick played his senior season mostly in Center Field and Right Field. In 2013, Erick played his first professional season with the Roswell Invaders in Roswell, NM. Shortly after the start of the 2013 season, he was traded to the Joliet Slammers in Joliet, IL in the Frontier League. In his first professional season between two leagues, he hit .309/8 HRs/ 46 RBIs/22 SBs. Erick played his last season in 2014 with the Roswell Invaders finishing the with year with a .280 batting average rounding out his career with a .304 batting average. Jeff was born in Indianapolis, IN and played football, baseball, basketball and wrestled while attending Northwest High School. After graduating he continued his baseball career at Florida Junior College and Indiana University-Purdue University-Indianapolis where he played a number of positions including C, 2B, 3B and the outfield. During this time he became the Bullpen Catcher for the Indianapolis Indians, the AAA affiliate of the Cincinnati Reds. He began his coaching career at Brebeuf Jesuit High School as the Freshman/JV coach. He soon began his professional sales career and started coaching youth baseball and fastpitch softball. 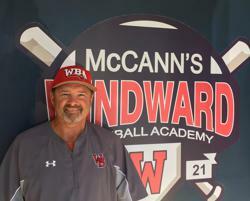 He brings over 25 years of coaching to the Windward Baseball, having coached teams and players from as young as 7U to college age players. 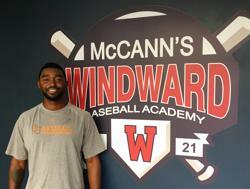 Jeff and his wife Julie have three children, all of whom are products of Windward Baseball Academy training. Megan played fastpitch at Chattahoochee H.S., Evan is an Alpharetta H.S. graduate is currently playing baseball at Georgia College and State University and Bryce is a rising 10th grader playing baseball and football at Alpharetta H.S. Jamal went to Harrison High School in Kennesaw, Ga where he graduated in 2008. Throughout his high school career he received many accolades among helping his 16U team win the AAU Jr. Olympics National Championship. In 2008, Jamal was the Atlanta Journal Constitution All-Northwest Player of the Year. He also snagged the Marietta Daily Journal Player of the Year honors and was First Team All-State. After his senior season he was drafted by the Houston Astros in the 50th round of the 2008 MLB Amateur Draft. Concluding his freshmen season at University of Alabama at Birmingham, he was named to the Conference USA All-Freshmen team where he was the second leading hitter in conference play with a .337 average while leading the conference with 28 stolen bases ranking 28th in steals nationally. In 2010, Jamal lead UAB in hits (76), triples (3) and ranked third on the team in doubles (13). He was ranked the 57th toughest player in NCAA Division 1 to strike out --with just 15 strikeouts in 209 at bats. Jamal spent his 2010 summer playing in the Great Lakes Summer Collegiate league where he played for the Lima Locos where he was named to the Great Lakes Summer Collegiate league All-Star team. Jamal made his minor league debut in 2011 when he was drafted by the Seattle Mariners in the 13th round. In his rookie season with Rookie-Level Pulaski he earned APPY League All-Star honors. Jamal spent time in Rookie, A, Adv-A, AA and also appeared in a Big League Seattle Mariners Spring Training Game in 2013.